The 36th annual Moscow Sabre tournament took place in the Russian capital this weekend.The competition's importance is growing ahead of the 2012 London Olympics as RT’s Konstantin Potapov reports. 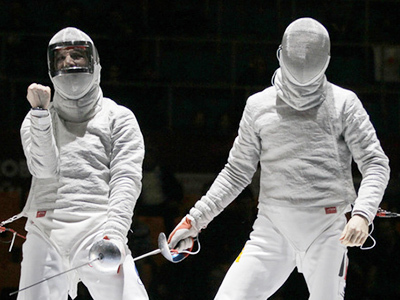 The traditional Moscow Sabre is the last tournament before the start of qualifying for the 2012 Olympic Games.The pressure is rising, and that's why the world's best fencers gathered in the Russian capital to engage their sabres and go for glory. The final round presented lots of eye-catching encounters in the men’s team event. Throughout the entire day squads from across the globe fought for a podium place. In the battle for third spot, Belarus faced powerhouse Italy.The bouts were tight, the Belarusians took an early lead before Squadra Azzura made it all square. Buttheir opponents had enough patience and no end of skill to seal the fight in their favour. Meanwhile, in the final the hosts met Germany. Russia had never won a team competition on home ground and this time around they were determined to put that right. They were dominating from the off showing an extended repertoire of moves and high speed of sabre fencing. And in truth they looked like champions well before the end as they claimed a well-deserved victory 45-30. Next year the Moscow Sabre will be the last competition before the Games in London, and that will make the tournament crucial in terms of qualifying for World sport's biggest tournament.